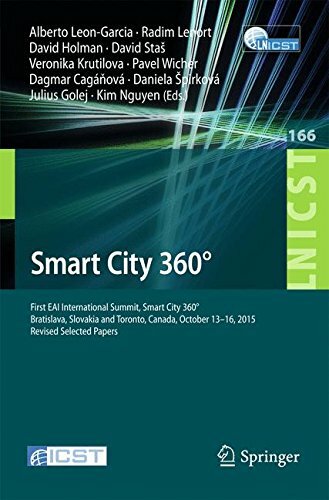 This volume constitutes the thoroughly refereed post-conference proceedings of the First EAI International Summit, Smart City 360Â°, held in Bratislava, Slovakia and Toronto, ON, Canada, in October 2015. The 77 carefully reviewed papers include eight conferences: The Bratislava program covered the Conference on Sustainable Solutions beyond Mobility of Goods (SustainableMoG 2015), the MOBIDANUBE conference which strengthens research in the field of mobility opportunities and within Danube strategy, and the conference on Social Innovation and Community Aspects of Smart Cities (SmartCityCom 2015). In parallel the SmartCity360 Toronto included five conferences addressing urban mobility (SUMS), sustainable cities (S2CT), smart grids SGSC), wearable devices for health and wellbeing SWIT Health), and big data (BigDASC). About: This volume constitutes the thoroughly refereed post-conference proceedings of the First EAI International Summit, Smart City 360°, held in Bratislava, Slovakia and Toronto, ON, Canada, in October 2015.